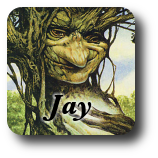 3/07/2011 - I design hybrid cards a lot. 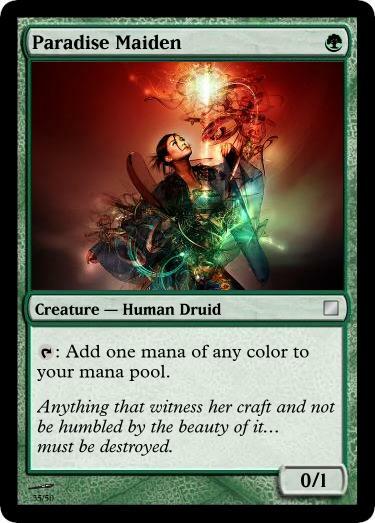 It's not because I have a disproportionate love of the hybrid mechanic—which I do—but rather, it's designer shorthand for "this card could go in either of those colors as the set needs." Challenge is a perfect example of this technique. 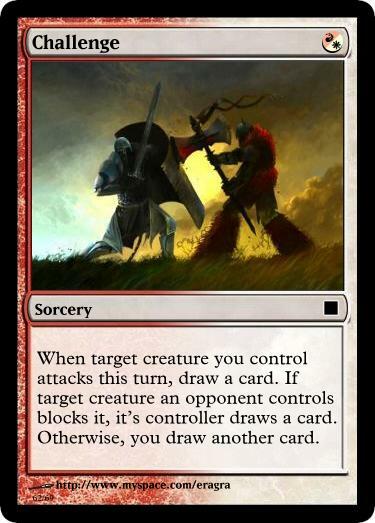 I'm not actually proposing this card be printed as a red-white hybrid card (though it could be) only that it can be printed as a red card or a white card with pretty much equal validity. While provoke is a solidly green mechanic and Challenge holds a lot in common with it, there is a very real mechanical/flavor distinction that makes it white/red instead. Provoke is basically, "my creature hunts yours down and fights it," while Challenge is, "my dude is calling your dude out. Do you honor the challenge?" Gameplay-wise, I have no idea how good this is. I would really have to try it out to see. It seems like you're either drawing two cards for 1cc or killing your opponent's small utility creature while keeping card parity and accelerating the game. It's certainly conditional upon you having a creature (and one big enough to kill your opponent's, at that) and can be countered by removal. The wording is imperfect, but as long as you get the gist, that's not a designer's concern. 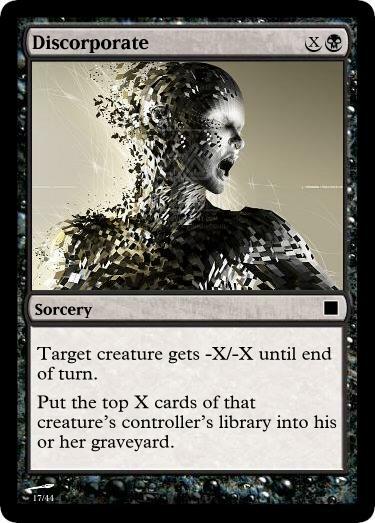 I also didn't think about the rarity at all: The point is less the card itself than the idea and where that leads. Designers often go through so many ideas, that shortcuts like these are often necessary to get them all down before some are lost. To clarify the distinction between shortcut and shortcoming, I'll show you where I did fail as a designer on this idea. As written, you can target a tapped creature your opponent controls and it's basically guaranteed unable to block. 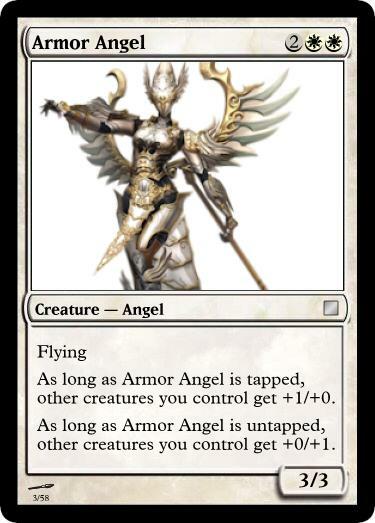 While leveraging quirks like targeting a creature with "can't block" would be fun and is fine to reward, being able to target tapped creatures is clearly too easy and against the spirit of the card. I really like this. 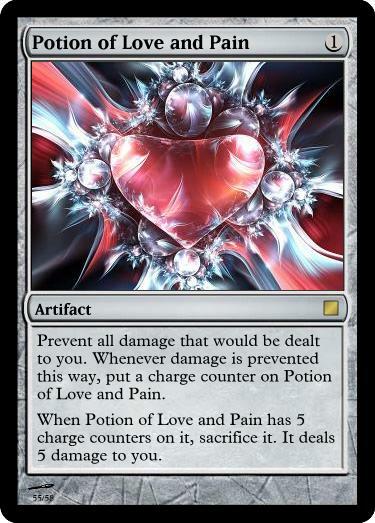 It's a very clever twist on provoke-style mechanics.